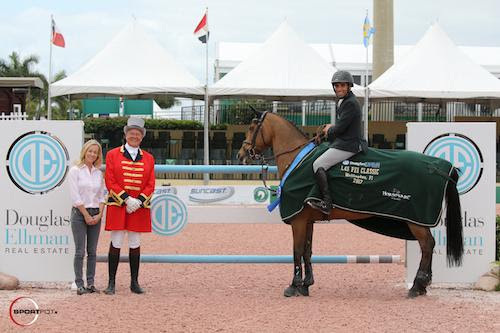 Wellington, FL – March 8, 2017 – Egyptian show jumper Abdel Said took his first major victory at the 2017 Winter Equestrian Festival (WEF) on Wednesday, riding Hope van Scherpen Donder to a win in the $35,000 Douglas Elliman 1.45m to start week nine in Wellington, FL. The ninth week of WEF features CSI 5*/2* competition at the Palm Beach International Equestrian Center (PBIEC) on March 8-12, 2017. 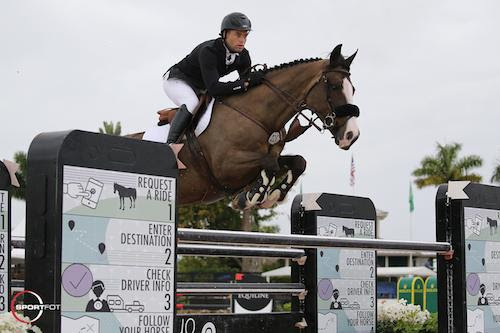 Highlights include the $380,000 Douglas Elliman Grand Prix CSI 5*, presented by The Bainbridge Companies, on Saturday, March 11. The 12-week WEF circuit continues through April 2, 2017, awarding over $9 million in prize money. Alan Wade (IRL) is the course designer in the International Arena at PBIEC for WEF 9. Wade began the week with 53 starters over his 1.45m track, held in a two-phase competition, with 18 double clear rounds. Said and AS Sport Horses’ Hope van Scherpen Donder stole the lead in the very end, second to last in the order, to take top prize in 33.43 seconds. Samuel Parot (CHI) held a long lead, but moved to second place with his time of 33.45 seconds aboard Couscous van Orti. Daniel Deusser (GER) finished third in 33.56 seconds riding Stephex Stables’ Hidalgo SX. “Hope is a very special horse,” Said described of the ten-year-old Belgian Warmblood mare (Quadrillo x Balou du Rouet). “She has a lot of character, and she is very competitive. She can be super fast when she wants to. She has her days; some days she doesn’t want to play, so I have to respect that. Said had a great 2016 season with Hope, which included a win in the Longines FEI World Cup qualifier in Verona, Italy, in November. The rider is based in Antwerp, Belgium, throughout the year, where he runs his own training and sales program. Also competing in the International Arena on Wednesday, the first class of the day was the $8,000 Douglas Elliman CSI 2* 1.40m with a win for David Arcand (CAN) aboard Hawaii van Paemel. The $1,000 CSI 5* Douglas Elliman 1.40m followed with a win for Jaclyn Duff (CAN) riding Windermere Stable’s EH All or None. Spain’s Sergio Alvarez Moya and Iron Man 111 were victorious in the $6,000 Illustrated Properties 1.40m to conclude the day. Week nine of the Winter Equestrian Festival continues in the International Arena on Thursday featuring the $130,000 Ruby et Violette WEF Challenge Cup Round 9. For full results, please visit www.PBIEC.com.